The drop in oil prices has forced operators to re-evaluate their casing designs to improve payback. With this re-evaluation, Vallourec has taken the opportunity to work with operators to question each aspect of their well designs in order to find ways to achieve higher strength, pressure and production performance with optimized casing designs outside the standard API dimensions. Creating customized diameters, wall thicknesses, along with optimized grades and premium connections has led to significant savings for rig time and steel costs in addition to providing increased performance and production. 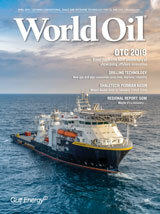 Now in its 92nd year, the World Oil Forecast/Review is the upstream oil and gas industry's most trusted source of projections and data relating to global E&P activity. Utilizing data collected from proprietary surveys of governments and operators in the U.S. and worldwide, this definitive industry report includes projections for spending and activity, worldwide drilling and productions, and an analysis of political factors impacting the U.S. and international oil and gas industry. As subsea assets age, corrosion issues start to arise and the integrity of those assets are compromised. With the combination of non-intrusive DiscoveryTM fast scans and extended scans, operators can quickly identify and accurately determine wall loss integrity flaws of both piggable and unpiggable subsea pipelines, all in real time and while online. This webcast, with case studies, will illustrate how operators can: obtain statistical confidence that their pipeline/pipeline system is within the acceptable tolerance specification, validate ILI inspection/eliminate operational risks associated with ILI usage, eliminate the costs associated with coating removal and ensure that there is no loss to production/deferment of revenue during inspection campaigns.